View Tambo River Basin in a larger map (opens new window). Rises in steep forest and flows into the Nowa Nowa Arm of Lake Tyers. The lower section near the Lake is usually the only section worth fishing. Access is by boat from the lake. Contains black bream, estuary perch, yellow eye mullet, Australian smelt and common galaxias. A small estuarine lake situated between the Gippsland Lakes and Lake Tyers. Contains yellow eye mullet and other estuarine species at times. A narrow (3-7 m) stream flowing through forested country, with native vegetation along the banks. Contains many deep pools, mud and boulder bed. A rough 4WD track runs parallel to the river, but is usually closed during the winter (June-October). Access down to the river from the track can be difficult due to steep overgrown banks. Only light angling pressure. Carries a large number of brown trout to 550 g, congoli, short-finned eel, long-finned eel, abundant small river blackfish and a few Australian grayling, Australian smelt, and common galaxias. Catches are good at times. Last stocked with trout by Victorian Fisheries Authority in 1982. The most easterly of the Gippsland Lakes, surrounded by cleared land to the north and scrub on the southern shore. Boating facilities at Metung and Paynesville. Fish species include black bream, mullet, luderick, flathead, silver trevally, whiting and garfish. Commercial fishing is permitted in Gippsland Lakes. However the majority of licences have been bought out through the voluntary buy-back scheme, funded by Recreational Fishing Licence revenue. Flows from forest to cleared land, gravel and rock bed upstream, mud in the lower reaches. Carries abundant brown trout to 450 g, short-finned eel, long-finned eel, congoli, and river blackfish. Access is through private property, please ask permission. Fished mainly by locals. Last stocked with trout by Victorian Fisheries Authority in 1983. Flows through forest above Deptford and cleared land downstream. Above the Princes Highway it has a variety of river structure. Some sections near Sarsfield have narrow shallow riffles (4-6 m wide and 30 cm deep) with sand and gravel substrate. Other locations downstream have deep, wide pools (over 100 cm deep and up to 20 m wide) with cascades and riffles with bedrock, and boulder substrate. Riparian vegetation is native forest and tea-tree. Access is difficult upstream of Deptford. During summer there are often low flows and high water temperatures. Contains one of the best river blackfish populations in Gippsland with numerous fish to 600 g. It has only a few brown trout to 1.2 kg, (av. 270 g), short-finned eel, long-finned eel, Australian smelt, common galaxias, flathead gudgeon, shorthead lamprey, congoli, Gippsland spiny crayfish, a few Australian grayling and European carp in the lower reaches. Below Sarsfield, the estuary contains black bream, Australian bass, luderick, yellow eye mullet, sea mullet, trevally, flathead, tailor, river garfish, and some estuary perch. The most common species taken is black bream and popular fishing areas are all downstream of the Railway Bridge. Local anglers use sandworms, live and frozen small prawns. The estuary is, however, generally not as productive as the Tambo and Mitchell River estuaries. Work has been carried out to remove willows, fence and revegetate banks, and restore bank stability as part of the River Health Program. The Recreational Fishing Licence Trust has supported the construction of four fishing platforms and the installation of instream fish habitat. There is a self-sustaining brown trout population in the headwaters where the habitat is suitable. Last stocked with trout in 1983. Flows through bush to the Toorloo Arm of Lake Tyers, mud substrate. Carries a few Australian bass, mullet and European carp. Access requires walking. A small, shallow tributary of the Tambo River flowing through farmland. Contains brown trout to 350 g, (av. 100 g), short-finned eel and congoli. Lower reaches easily accessible from the highway. Despite the fact that three of its main tributaries carry good self-supporting brown trout populations (Haunted Stream, Swifts Creek and Timbarra River), the Tambo River carries few trout downstream of Bindi. Extensive trout stocking by Victorian Fisheries Authority to 1974. Although there is no physical barrier to the downstream migration of fish from the feeder streams, several springs (eg Wilga Springs) naturally discharge chemicals including copper into the river. Trout have always been scarce in the middle and lower Tambo River. One reason for the failure of trout to colonize this section of the river could be the high water temperatures present during summer. Small numbers of brown trout have been found in the main river during surveys in cooler months. Whatever the cause, the freshwater section of the Tambo River is not a productive angling water. The road to Bindi follows the river but access to the headwaters above Bindi is through private property, please ask permission. The river flows through cleared hills and some forest. Channel width is around 5 m with extensive riffles. Small-sized brown trout and rainbow trout are present as well as Australian smelt, river blackfish, common galaxias, congoli, and occasional Australian grayling. Flows through an extensive area of grazing land before entering forested-hills at Tambo Crossing. 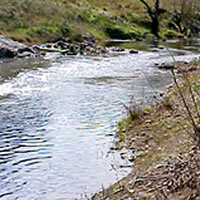 The river at Swifts Creek is 10-12 m wide with extensive riffles 30-40 cm deep and some pools 60-140 cm deep. In some other reaches, channel width is up to 60 m. Substrate is rubble and gravel. Riparian vegetation is grass and willows and the banks are stable with little erosion or instream sedimentation. Habitat is satisfactory with fish cover provided by willow roots and woody habitat and overhanging foliage. Fish taken in surveys in this area were predominately common galaxias and Australian smelt with some congoli and very occasional brown trout. Downstream towards Tambo Crossing, river blackfish, Australian grayling, short-finned and long-finned eel, and shorthead lamprey were present. Flows through steep forests to Bruthen. Good riparian vegetation of wattles, eucalypts and other native species with willows at the lower end of the section upstream from Bruthen. Channel width is up to 20 m and the substrate varies from bedrock, boulders and rubble upstream to the same material but with patches of sand and mud, downstream. There are well-defined riffles and pools upstream, then predominantly continuous runs in the lower reaches. The main road runs parallel to the river for some length but then diverges, with access from several good tracks into the river. Carries abundant Australian grayling, occasional Australian bass, southern pygmy perch, Cox's gudgeon, brown trout to 550 g, and other species mentioned in the section upstream. Between Bruthen and Tambo Upper, the river has extensive sedimentation and provides poor fishing. Channel width exceeds 25 m, with water depths during summer mostly less than 50 cm and not exceeding 60 cm. The substrate is all sand. The only fish habitat occurs along parts of the bank and is suitable only for small-sized fish. Contains European carp. The river narrows and shallows near Tambo Upper where a sand bar has formed in the river at the head of the estuary. Below Tambo Upper, the estuary extends through open farmland and has a mud substrate. It is accessible along the Metung Road for bank fishing but best access is by boat. There is a boat ramp at Johnsonville. Predominant species are black bream, yellow eye mullet and estuary perch to 1 kg, Other species include luderick, European carp to 3 kg, and sea mullet to 2.7 kg. Any species occurring in Lake King may also enter the Tambo River on occasions. The estuary is heavily fished for black bream and at times provides excellent fishing. Estuary perch are very abundant particularly upstream of the Princes Highway Bridge. The catchment management authority has constructed a number of fishing platforms and installed some substantial logs as instream habitat in this area. There has also been removal of willows and fencing and revegetation of banks as part of the River Health Program. The Recreational Fishing Licence Trust has contributed to this work and to improving access tracks for anglers. Flows through forested mountains in steep gorges, mud gravel and boulder bed. Numerous pools and runs with a good flow even in dry summers. Access is difficult with considerable walking necessary to fish the river. Carries predominantly brown trout av. 450 g, max. 1.3 kg, a few small rainbow trout, river blackfish, short-finned and long-finned eel, congoli and Australian grayling. Regarded as a good trout stream and heavily fished. Regular trout stocking ceased in 1967. A trial stocking of fin-clipped fish in 1982-84 followed by an intensive creel survey showed that the majority of fish taken were naturally spawned. Stocked fish replaced the natural fish for a short time in anglers catches but did not increase the overall catch rate. It was concluded that further stocking was not justified. Willows have been removed from the banks and within the stream, and the banks have been fenced and revegetated as part of the River Health Program. 1,600 ha. Camping facilities, boat ramps. Ramsar listed.